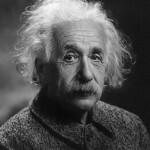 Albert Einstein was a German-born theoretical physicist known for his mass-energy equivalence formula, E=mc^2. He also discovered the law of photoelectric effect for which, along with ‘his services to theoretical physics’, he was awarded the Nobel Prize for Physics in 1921. Einstein became an American citizen in 1940 and helped President Franklin D. Roosevelt recognise the need for the US to begin research on atomic weaponry.